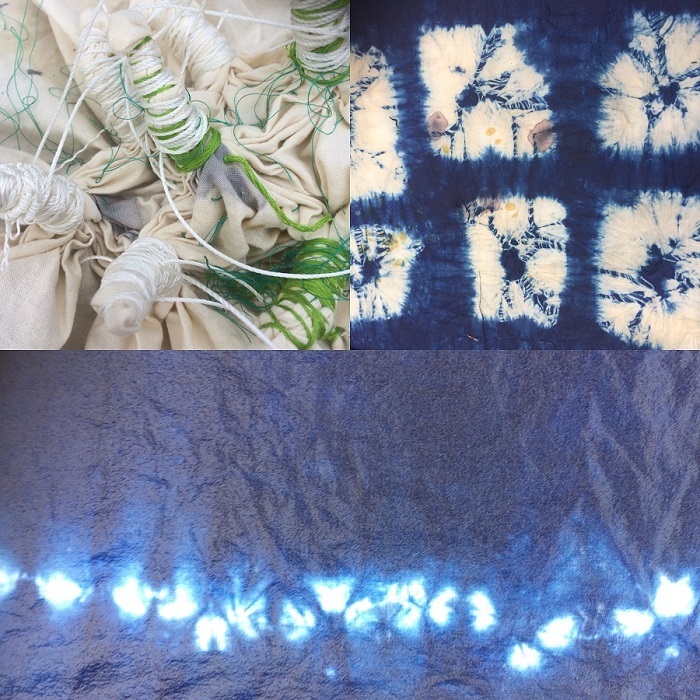 I have just put together a new weekend course for 2019 -Indigo dyeing. The weekend will combine shibori techniques from Japan and Batik techniques from Java, to create resists on fabric, which will be dyed in an Indigo vat. I love both these techniques, and first learnt about Batik, when I was 17 and travelled to Java to study it with a couple of friends of mine, we spent 6 weeks out there, with various batik artists learning about batik and other textile forms from Indonesia- we also had a lot of fun and discovered white sandy beaches, temples, trekking, island hopping and upset stomachs! Batik works brilliantly with Indigo, as the indigo dye vat is not too hot so it won’t melt the was off the fabric when dyed. I have combined the batik with Shibori, as I have always found stitching so relaxing, and although there is no need to stitch, as you can also fold and clip, I find the stitching one of the most enjoyable parts of shibori. The stitches or folds act as the resist to the Indigo dye, and when it is unfolded or unpicked you are left with a pattern. Indigo is such a wonderful dye, as it is so instant and has so much intrigue and wonder around it. All over the world there are different techniques and recipes in making an indigo vat, and many of them are layered with traditions and also honour to those creating the vat and to the vat itself -such an interesting dye! If you would like to find out more about Indigo and want to join us in the Highlands of Scotland for our 2019 Indigo workshop please follow this link..